A prime minister from the ranks of the rebels and no general amnesty -- these are the cornerstones of the peace treaty that has been initialed by the government of the Central African Republic and 14 rebel groups. Peace treaty No. Eight in almost six years has now been initialed by the government of the Central African Republic (CAR) and 14 rebel groups. All previous agreements signed since 2012 failed. This time the hope is that the treaty really will bring peace to the conflict-stricken country and end more than five years of conflict. 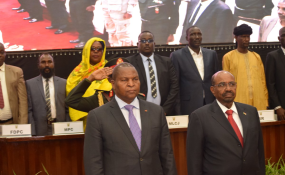 The agreement was negotiated in the Sudanese capital, Khartoum, with the mediation of the African Union and the United Nations. On Tuesday it was initialed by President Faustin Archange Touadera for the CAR government and militia representatives in the CAR capital, Bangui. It will be formally signed "in the coming days," Touadera's office said, without announcing a date. According to information from DW sources, the parties involved agreed on five main points intended to set the course for a stable and peaceful CAR. Paul Melly, Consulting Fellow with the Africa Program at Chatham House in London, remains cautious: "Optimism is probably stating it too strongly, but there are some reasons for hope. The fundamental problem is that this is a very complex situation in a poor, thinly populated country where the authority of the state is very thin," he told DW. He thinks the accord is based on well-considered agreements. "This particular deal has been prepared through many months of painstaking negotiation, but also efforts by the various mediators to properly understand the grievances of the different armed groups and the different social and economic pressures that partly lie behind them," Melly said. The agreement covers various aspects, including the implementation of a government of national unity bringing together all political and social forces of the country. This includes the Muslim Seleka rebels as well as the mainly Christian anti-Balaka alliance. Fighting began in 2013 when Seleka rebels seized power in Bangui, with anti-Balaka militias fighting back. Some 1.2 million people have lost their homes due to the fighting. Will the rebels give up on power? "Any time you can get these people around a table talking about stopping that, that's a good thing," said Lewis Mudge, senior researcher in the Africa Division at Human Rights Watch (HRW). "The previous deals haven't worked because these rebel groups control so much territory that they stand to gain nothing from conceding power and have everything to lose." The rebels are autonomous in vast parts of the country, including areas with mineral deposits which they can profit from, Mudge says. "I don't see them entering into any sort of deal in which the central African state actually completely takes over territory." HRW had documented vast human rights abuses, he said. "These groups don't respect international humanitarian law. They don't delineate between civilians and combatants. So to treat these groups as equal partners at the table to give them some autonomy, if that does emerge, is very worrying." Another obstacle is the difficulty of making the government function as a team, says Melly. "In terms of the actual running of the administrative machine, finding people who can be capable ministers, that might be possible, but whether those people are able to really engage the full support and participation of their different groups that nominally put them there, is a much more difficult question." Another agreement in the deal is that the prime minister is to come from the ranks of the rebels. The name circulating is Moustapha Sabone from the "Front populaire pour la renaissance de la Centrafrique" (FPRC), the most important Seleka rebel faction. "The question will be how far that prime minister will command full authority because you can't really talk of a coherent single rebel entity," Melly told DW, adding that there are many different fragmentations and rivalries between different armed groups, which in the last couple of years have been in conflict with each other, tussling for control of key resources and strategic towns. "So while it makes sense to have a prime minister who comes from the ranks of the rebels, it's not so certain what he will actually be able to deliver in terms of authority." The rebels haven't got everything they wanted. The armed groups appear to have demanded a general amnesty which was rejected by the CAR government. According to DW information, the consensus is for a form of transitional justice. The crimes that members of the armed groups are accused of are to be treated as individual cases, with charges only brought in serious cases such as crimes against humanity. For less serious crimes, such as theft, there would be an amnesty. "The notion that hundreds of fighters from different groups would have been brought to justice for abuses would have never been plausible. It would always have been a case of identifying specific individuals, presumably those who had played a leading role in either carrying out or inciting human rights crimes or alleged human rights crimes," Melly said. The last two points of the treaty include the implementation of a Truth, Reconciliation and Compensation Commission and the setting up of mixed brigades of Central African soldiers and rebels under the supervision of the UN Multidemensional Integrated Stabilization Mission in the Central African republic (MINUSCA), to disarm, demobilize and reintegrate the rebels. In this way, the UN mission is going to obviously have a role in this deal, says Mudge, and that would be appropriate. "The major player on the ground is the UN peacekeeping mission. They have 12,000 armed police and troops and they are also the mission with the logistical capability of moving around the country." But the UN mission is there primarily for civilian protection, Mudge emphasizes. The next step is to implement what the parties have agreed on. That will be a practical challenge, Melly believes, with many questions to be answered. "A new government has to be formed. With a reported 14 rebel groups involved in this process, are they all are in a position to nominate people of ministerial caliber? Should they all be represented in the government? How do you differentiate between groups which are very tiny and groups that are quite large? How far do you balance that with people from the existing government's political base? And how far do you balance that with people who are perceived by the many Central African citizens who are not involved in armed activity at all?" Although all these questions are still open, finally asking them is a first step forward to a peaceful future for the Central African Republic.